In this review guide, you will learn all about pressure pot spray guns. We will explore exactly how the products works, their features and their drawbacks, and what paint jobs the spray guns are good for. We will also go into detail on the paint spray nozzles, exploring how they work and how the quality affects your paint job. The products selected have been researched especially from reputable sources and so you can guarantee that the products listed here are new and popular. A quick comparison table is provided with complete reviews of each paint sprayer further down the page. How Does a Pressure Feed Spray Gun Work? What Paint Jobs Are Pressure Feed Sprayers Good For? The spray gun is charged as well as the droplets of paint. Given the same charge, they repel each other and produce a fine spray. The part you are spraying on is typically the opposite charge and therefore the droplets of paint attract to the body part. This produces an even coat with little waste. In terms of electrons, the paint gun loses its electrons and becomes positively charged. The droplets of paint lose electrons too and also become positively charged. The object to be painted gains electrons and become negatively charged. The paint gun and droplets repel each other whilst the droplets and the object to be painted are attracted to each other. A pressure pot feed spray gun is great for applying latex paints, stains, sealers, top coats, long life epoxies, zincs, and lacquers to wood or steel. It is particularly great for spraying and touching up cars. The paint lasts longer and it will always look better than other types of spray guns. A Honda Civic was painted in just under 70 minutes with no paint sanding necessary. The key is in the preparation. Rust was removed a day before from the car, and body filler applied. The entire car was sanded and a primer was used to perfect it. This took longer than the painting itself, but the preparation allowed this to happen. It is also advised to practice your HLVP spraying technique before committing to a project. Practicing on a vertical surface and a horizontal surface first will make sure you can spray evenly without leaving a drip. The Astro 2PG7S-2 comes with 2-quart pressure pot, which allows you to mix and paint at the same time. It is equipped with pressure gauge and fluid pressure regulator for accurate settings. The 6-feet twin set of hose allows for easy movement and operation. It is excellent for spraying large areas such as buses, trucks, and vans. However, when in use, the hoses are not as flexible as they could be. The TCP Global Pressure Tank paint spray gun comes with an impressive heavy duty paint pressure pot tank with 2.5 gallons’ capacity. The gun is heavy duty too, coming with a 1.5 mm tip. The hose assembly consists of air and fluid and is 10 feet long. For safety, it has an air pressure relief valve. It works at an optimal pressure of 25-30 psi and is excellent for commercial painting projects such as automotive, oil-based, latex, varnishes, lacquers primers, wood coatings, and adhesives. This pressure pot feed spray gun is perfect for projects that require a large amount of spraying such as commercial trucks, vans, buses, or architectural or industrial finishing. For those needing help, it comes with an instruction manual and one year warranty. Manufacturer’s hose does not stand up to spraying adhesives. The 16843 pressure pot spray gun comes with a five-foot hose, allowing for easy movement. The cup size is 2 quarts, so whilst it may be small, it is perfect for tight spaces and smaller projects. The average air consumption is 16 CFM. The spray gun comes with 1.2 mm, 1.5mm, and 1.8mm nozzles perfect for primers, base, and clear coats. You could use this gun to spray large areas such as trucks, vans, and buses. For accurate settings, it is equipped with pressure regulator and gauge. Comes with a five-foot hose. Equipped with a pressure regulator and gauge. Small cup at 2 quartz. Has a small over spraying issue with paints and water. This Devilbiss Finishline FLG0670 pressure pot feed spray gun comes with a 2-quart pressure pot. Using an air adjusting valve, you can change the pressure and flow of the paint coming out. You can expect consistent results from the Devilbiss FLG-670 with its soft uniform patterns. It’s precision machine air cap and fluid spray gun nozzle delivers quality finishes. It also possesses high transfer efficiency for HVLP spraying applications. Built from forged aluminum, it has an excellent weight-to-strength ratio. With high-grade stainless steel components and anodized finish, this pressure feed spray gun is easy to clean. Fan pattern not be wide enough for all jobs. Doesn’t have a storage case. The Valianto W77-S comes with multiple nozzle sizes for different needs. Its classic ergonomic body design is easy to operate. The 1000cc cup capacity saves you a lot of time on refilling. Operating at pressures between 50-70psi, it offers the perfect condition for spraying. With lightweight material, the user will experience less fatigue whilst delivering the best performance. The pressure pot feed spray gun can be used for a variety of projects including automotive, industrial, marine, and wood. With low energy consumption, high efficiency, easy maintenance, and overall reliability, you will have the perfect experience. Operating at high 50-70psi pressure. Fitting does not work with a typical air hose. The Valianto NEW71-G offers similar features to the W77-S. It comes with multiple nozzle sizes, achieves pressures of 40-60psi and uses a lightweight material to reduce owners’ fatigue. With this pressure pot feed spray gun, the tank is smaller at 400cc. This is still a substantial amount for those not wanting to refill on a regular basis. The new design has been upgraded from the previous W71-G model. It is now designed to solve the problem of adhered lacquer upon the first shot of spraying. The distance between cup and nozzle has been reduced to lower fatigue. This spray gun is perfect for smaller jobs and touch-up jobs that require quick color changes. Great if you’re looking for a smaller, cheaper version of the W77-S.
Small tank at 400cc that requires constant refilling. This Dovewill nozzle paint spray gun comes in extremely handy when working with small areas and tight spaces. Perfect for applying base coats, it features adjustable paint flow and fan width controls. Supplied with a composite gravity feed pot, it is suitable for use with water-based paints. It comes with a small, lightweight design to reduce fatigue. The cup is small, falling at 120 ml. However, this is perfect for your small projects that don’t need constant refilling. The max spray flow is 0.5l per minute and the nozzle size is approximately 0.8mm. Adjustable paint flow and fan width. Small cup at 120 ml. This G830 comes with 2.0mm stainless steel nozzle, 0.12l cup and a plastic material strainer. The nozzle is perfect for gel coats and resin. The spray gun is perfect for mold repair, composite refinish, and delicate boat hull repair. You can also adjust the spray pattern width and material volume. However, if you want to use gel coat, you will need a tip bigger than 2.0 mm. In addition, there is the option to add a bigger cup. To combat the common issue of the flat seal behind the threads disintegrating after washing with acetone, the G380 has cast the seal into one piece. Flat seal does not disintegrate unlike other competitors. Comes with a 2.0mm stainless steel nozzle. Perfect for gel coats and resin. Option to add a bigger cup. You will need a bigger tip if you want to use gelcoat. The A7500T comes with a 1.0 mm nozzle and a B gold air cap. For ease of transport, you get a deluxe gun carrying case and a spare parts kit vital if you lose or break a part. In addition, you get the Apollo spray gun lube and a wrench. The gun weighs only 0.48kg, reducing owners’ fatigue. The sprayer gun does not come with any pressure pot but is ready to fit any that use a 3/8” fluid coupler. 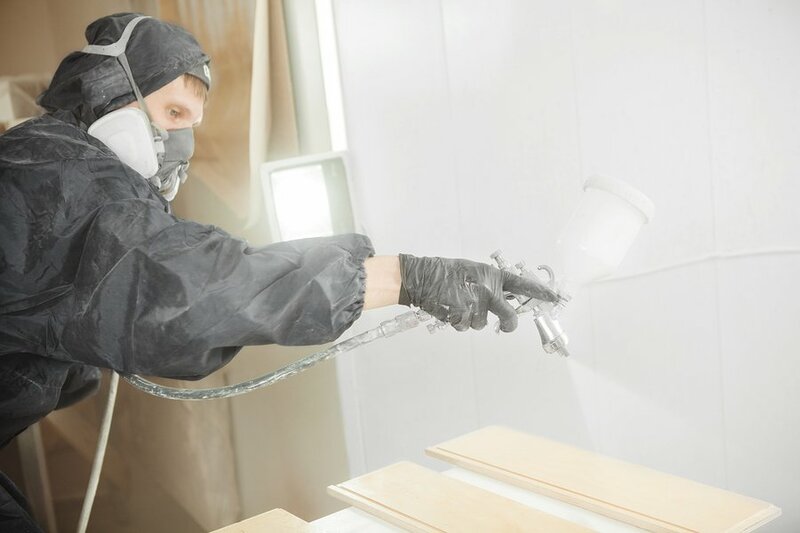 The spray gun can be used to spray solvent-based materials including enamels, stains, lacquers, polyurethanes, catalyzed finishes, conversion varnishes, and linear polyurethanes, as well as any waterborne coatings, and latex paint. It is perfect for providing an amazing finish to wood, boats, automotive, and airplanes. Comes with a deluxe gun carrying case and spare parts kit. Perfect for wood, boats, automotive, and airplanes. Does not come with a pressure pot. Only comes with a 1.0mm nozzle. The Excelvan professional spray gun comes with the peace of mind of a 1-year warranty. It’s stainless steel nozzle and needle, high hardness, and wear resistance make the spray gun extremely durable. It is suitable for spraying small projects like cars, machines, furniture, instruments, drawings, toys, crafts, and other small spots. It boasts high-speed spray with perfect pulverization. This allows for an even distribution of paint, providing the perfect coat. This gun is ideal for topcoat painting work. However, the spray gun needs to work with an air compressor. The aluminum cup is only 7.05oz but is perfect for small jobs. The pressure is on average 36.3 PSI and the painting width is 20cm. High speed spray and perfect pulverization. Perfect for topcoat painting work. Need to work with an air compressor. Pressure pot feed spray guns are the best types of spray guns to control the paint. Due to the fluid and air pressure being controlled separately, you have the ability to produce smooth finishes to your project. In addition, if a coating is viscous, you simply increase the pressure of the paint and you’ll be good to go. Majority of the paint spray guns are HLVP and so require 2 – 50 gallons of paint depending on the tank size. You are able to leave the system with a coating in it as long as the coating doesn’t have a limited pot life. However, the price of pressure tanks is around $950 compared to gravity or suction-fed guns. Clean up takes a bit longer and the extra hose can make working with the gun less comfortable. When considering whether to purchase a pressure pot feed spray gun, the volume of the paint you want to spray has to be taken into consideration. As seen in this guide, tanks can range from 2-50 gallons and if you’re working on a bigger project, you’re going to want a bigger tank. Your coating is another issue to contemplate. You need to determine if your coating needs to be agitated to be able to be sprayed. Best bet is to consult your coatings provider or the data sheet. In addition, if your coating is waterborne, you may want to consider a stainless-steel pressure tank to avoid corrosion. What is included in the package is also a must to consider. For example, in this guide, we have covered spray guns which include the tank and others which have not. If you are looking for something that gets you spraying straight away, you may want to consider buying a kit to save you money, time, and effort. In this review guide, we’ve reviewed the top pressure pot feed spray guns available on the market. From this, you need to evaluate your painting project and your requirements. How much paint are you going to use? What kind of paint? What is your object and how big is it? Do you want a full kit or to buy the parts separately for customization? 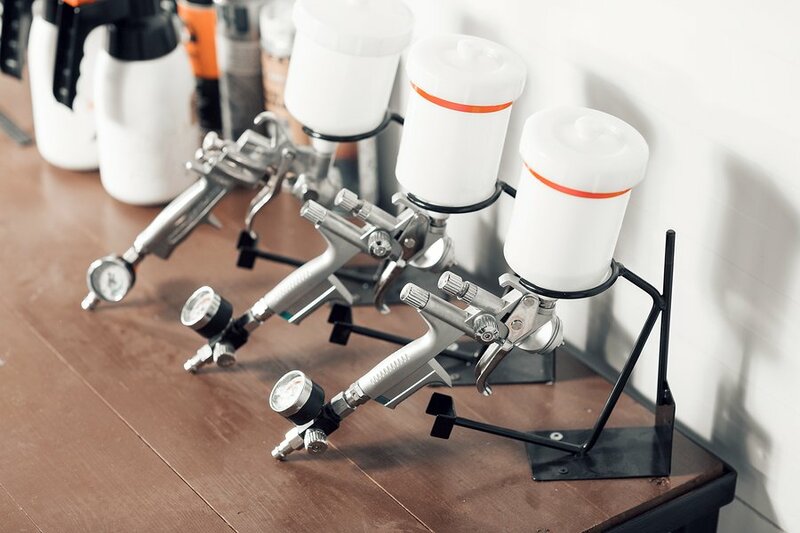 By answering those questions, you can pick out the perfect spray gun – be it one with a huge tank for a boat or a small one for a piece of furniture. Either way, it is going to be quicker and more cost effective than using a roller.